Directions: Mix all ingredients in a large bowl. Refrigerate at least 2 hours to mix flavors. If you decide not to use the Italian Salad Dressing Mix, season with salt and pepper. Serve with pita bread wedges, tortilla chips or grilled chicken. 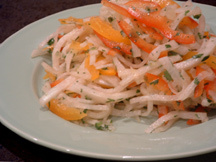 This make-ahead salad is inspired by the Mayan women selling slices of Jicama with lime and spices in Felippe Carillo Puerto. Sometimes here in Mahahual we are unable to get red and orange bell peppers, so we substitute with fruit using pineapple and mango. The result is sweeter, but our guests love it. You might also find jicama to be tougher and not as tasty outside of the Yucatan. Marinating for a few minutes in lime dressing before serving and adding a little extra sugar helps the taste and texture. Directions: Peel jicama and remove core and seeds from peppers. Julien all (cut in very fine slices, about 16" in diameter). Chop onion. Mix all ingredients together. Combine all ingredients for dressing except for salt and pepper. Pour over salad and mix well. Let set at least one half hour before serving. Salt and pepper to taste.